100 MIGRATORY is featured in GLAS – Architecture Design Environment Technique; a magazine for the Glass Industry Association no. 1 2013 on page 38-39. 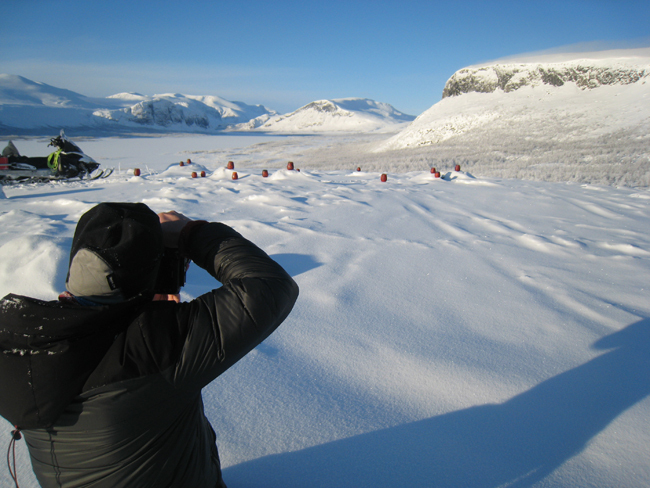 The image is from the local journey of the hundret glass vessels to the Ulldevis mountains in February 2012. It should soon be an article on www.tidningenglas.se about the organisation I am a member of called Glass Academy – the Swedish glass artists and designers. The article will refer to the image in the paper magazine. I know this image is a press photo belonging to the project 100 MIGRATORY, yet I am persistent to tell media that the photographers namne should always be written along the photo. That is not done in this magazine so I write it here. 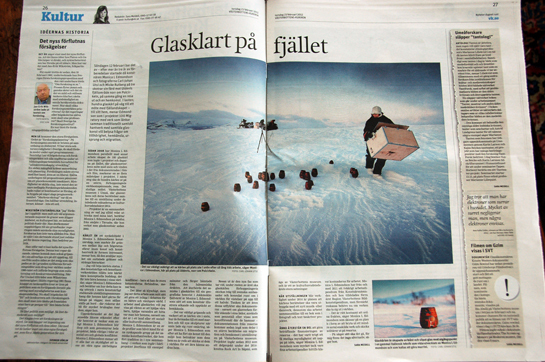 In todays regional paper Västerbottens-Kuriren you can find three pages about the photo journey with the hudred vessels into the Uldevis mountains. The article is written by Sara Meidell. It is actually one of the very few times in my life I proof read an article and I don’t have to change a thing – everything was just right! 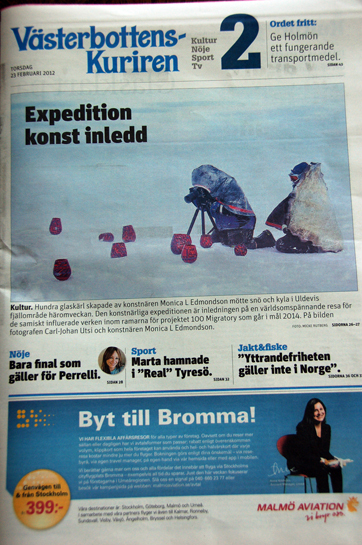 There are also some top photos by Carl-Johan Utsi and Micke Rutberg in the paper. However, we save the best images for the exhibition 2014…so more to come!! I felt very glamorous this morning when I put on my mascara and lipgloss. 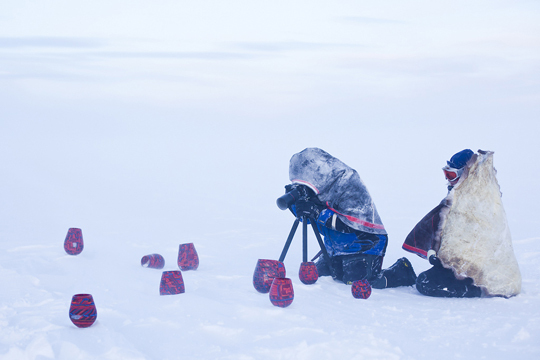 We were going to start the day by taking some outdoor “studio” photos of me in my Sámi national costume in the snow. 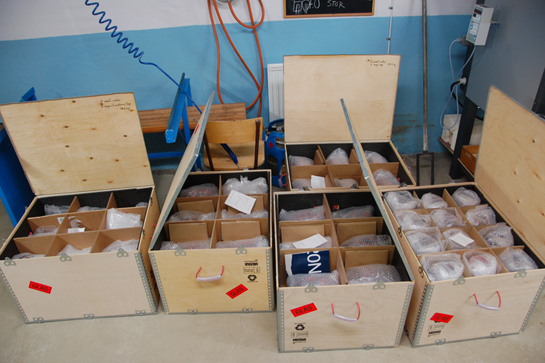 Then we took off further southwest with a crate of glass and our packs with food for lunch. It was a strange feeling as we were kind of racing with the clouds and bad weather. You could see the weather rolling in behind us through the valley but our snowmobiles were faster. It was just so beautiful, with sparkling crystals of light flying around in the air and snow covered northern kind of ‘bonsai’ trees. We ended up at Sijddojávrre and got some work done with the vessels and some high alpine peaks of Sarek National Park as a backdrop. Driving back to the hut I experienced a strong moment from this trip. This very clear, strong and beautiful face of a person came towards me. I could see it was a large rock, but it wasn’t a rock. It was this beautiful respectful Sami person. I thought of stopping to take a photo, but had a feeling I shouldn’t. Don’t take, just tell was the message. Later I realised it was a woman. Neither Carl-Johan or Micke had seen her from their snowmobile just in front of me. Back to the hut we boiled some reindeer meat for dinner, so delicious! I had forgotten how tiring it is to drive a snowmobile (even if we didn’t drive that far at all) and I want to give all my respect to people that are depending on the snowmobile for their work outdoor in winter. That night I was very tired and fell asleep early to the sound of Carl-Johan and Micke talking. Morning conversation about the lack of a scent of raspberry in the hut… And yes, I didn’t smell like raspberry either I suppose 😉 Packing and cleaning the hut and driving back to the cars. Lunch in Porjus and goodbye to each other for this time. I was just so tired. Thanks to Sirges sameby who let us use the Biesnes hut! And I give all my heart’s thank-you to Carl-Johan Utsi who organised most of the logistics for this journey. 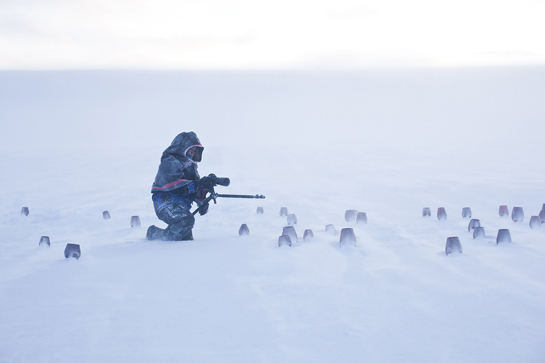 All of you will be able to look at the images from this trip during the exhibition based on the art project 100 MIGRATORY at theMuseum of Västerbotten in Umeå from January – April 2014. 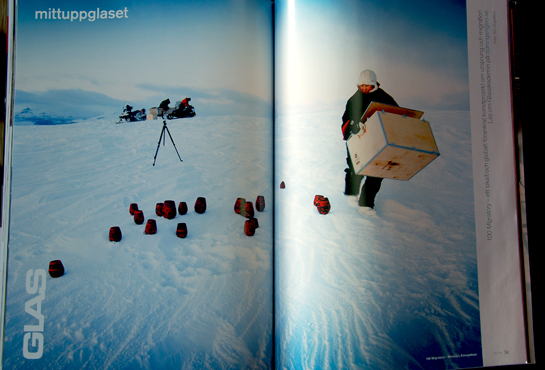 And Micke Rutbergs documentary photos from this trip will be on show in one way or the other too at the museum. Now it’s time for the next part of the project 100 MIGRATORY. To find a partner that is keen to sponsor part of the freight of the vessels to Swedish embassies and consulates around the world. Any suggestions to solve the freight are very welcome!? The trailer with glass, Micke and I drove from Gällivare – on the Road Westwards – to meet Carl-Johan and Tobbe Öberg at Kirjaluokta. 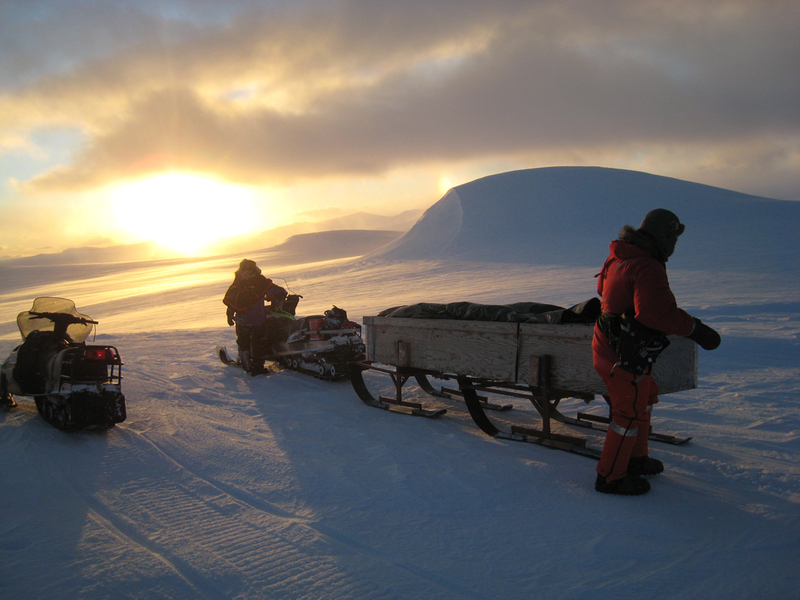 Packing and repacking and starting the snowmobile journey to Biesnes hut in the west area of Uldevis mountains. We were speculating in that Carl-Johan probably hold the world record after this trip, of value of goods transported in one single sled towed behind his snowmobile…!? After Tobbe and Carl Johan got rid of the rock hard wind packed snow from the door I was very curious to see the hut condition which, from my own experience, can vary. But Biesnes hut was just so spacious and with a warming new wood fired stove. A perfect basecamp. After lunch we decided to drive out and check sites for the next day, and in the end we unpacked a crate with glass onto the snow and got some good images in the late afternoon sun. I must admit I was also anxious to see if the packing of the glass had worked out, in other words…if the glass had cracked or not. But all well. Figured out glass stickers doesn’t work in the cold – the glue stop working and they take off faster than the wind…so sorry Mother Nature…a few bright orange glass stickers will be flying around in the mountains this winter. Managed to take care of most of the stickers though. I think Carl-Johan had abstinence pain in his body and soul from very poor internet connection in the hut, but he took off now and then to a nearby peak to check his email, twitter and connect to the world. I really hope all my helpers with making these vessels get a chance to take part of this journey in one way or the other. I couldn’t have done this project without you. Thanks Mille, Sandrine, Zoe, Yuki, Chiaki, Fumi, Annica and Simon! You are all part of it. Day two. Monday the 13th of February. We drove off with all the hundred vessels this morning and found a place around the area of Árasjávrre. It was super fast to unpack the glass and after a photo session we decided to drive back to the hut for a lunch break. That is when I realised my mobile phone was damaged and of no use. In the afternoon we returned and it was wild weather. The snow and the wind had made my vessels kind of grow into the ground. They were really part of the Uldevis mountains. It is strange how something you think and dream about, and hardly dare to verbalise even for yourself, suddenly can happen!? My vessels were behaving like rocks with snow drift around them, leaving a crate in front of the vessel on the windy side and a beautifully formed snowdrift sculpture on the other side. It was snow around the vessels, on them, in them. Some were almost covered with snow. At this moment I got tears in my eyes as I just felt so content and happy – just the feeling of seeing those vessels out there in the snow of Uldevis. I wanted to leave them out there forever…they kind of belonged there. On the way back I made sure I didn’t loose sight of the back light of Carl-Johan’s snowmobile as I wouldn’t find the way back to the hut by myself. More than 60 years ago my father was up on Uldevis skiing with Pava Kallok and one of his memories from that trip was the importance of not loosing sight of the rear end of Pavva´s skis as the weather was so bad he could hardly see Pava himself. Anyway, now and then I also looked back to check on Micke who was sitting on the sled towed by my snowmobile. It is not fun to fall off a snowmobile or a sled in speed – which can happen – but in these conditions it can be fatal as it might be hard for the rest of the team to track back where it happened. And I didn’t want a lost cold Micke to spend the night out in the dark on the Uldevis mountain. After dinner in the hut that night, Micke said he appreciated I was so responsible during the snowmobile trip to the hut because I looked back so regularly to check his camera gear was OK. I almost fell off the bed laughing when he said that… and, I certainly know his priority now! I’m back to civilization after four days with the best team of photographers, Carl-Johan Utsi and Micke Rutberg, and my hundred vessels. I still haven’t been able to catch up with it all, I’m still tired and the impressions from the trip are still in that unorganized mode in my head where they float around, creating heaps of strong feelings. 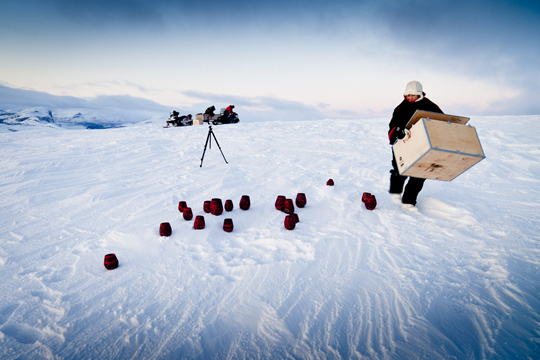 It is flashes of boxes and boxes of glass, powerful snowmobiles and bubblewrap trying to take off in the wind. The fox that came around each day having a feast of the reindeer that sadly died not far from the hut. Wind and snow that made my glass become part of the mountain. Gourmet dinners in candle light and a deep sleep obtained after I realised I need to use earplugs due to a loud snoring photographer. Millions of stars, two frostbitten fingers, and a strong beautiful áhkko who left an unforgettable impression on the last day. I think this journey of the hundred vessels into their so called home, their core, really wanted to work out to its best. So many things can go wrong but this journey just wanted to be good. And the weather was just as we ordered; cold harsh windy snowy sunny and just so beautiful. Micke and I took off from Tärnaby to Gällivare, almost 500 km north, where we were going to do some shopping at the supermarket and spend the night with my parents. We stopped in Kåbdalis to visit Kristina Unga-Pirak and Marie Nygårds bageri och lanthandel, and it was like the centre of the world! There I met many friends I haven’t seen for ages and Micke got a good story told of his old camper-van (previously owned by Lars Pirak) told by Lars’ son Mikael. Ulldevis mountains – here we come!